Home » 2008 Bentos » I’m Back! I have three bentos to talk about today. I felt like I had to start back up again before my co-worker Junko came to riot at my desk tomorrow or something. She gets very upset when I don’t post for a long time, it cracks me up. It’s so nice to have a fan at work! She’s my foodie soul-sister, so I owe it to her to bring the bentos back into my life after such a long hiatus. I made and ate this bento two and a half weeks ago. It’s chicken katsu with hapa rice and ume. On the far right there is some pan simmered eggplant. Resting on top of that are mixed tomatoes, then raspberries beneath that. At the bottom I have three sweet potato flowers. When I bought the tomatoes I thought, oh cool, a green colored tomato. I didn’t think that it was actually just a green tomato. When I ate it, it was pretty dang sour and tasted… well, green. I was pretty happy with the way the colors came out. Obviously I was able to get my camera to behave somehow. Yay! I had this bento today. It’s composed of rather odd ingredients, but it’s what I felt like eating and the colors went rather well together. I have hapa rice with a pork hash patty cut in half. To the right are mixed tomatoes, below that a Babybel cheese, slices of avocado, and then cucumber pickles in the little elephant cup. 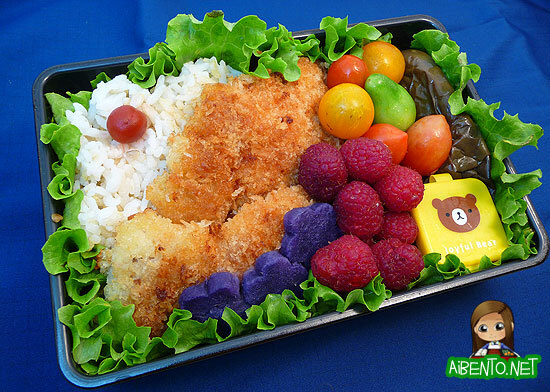 Here I am with my Final Fantasy XI Fan Festival 2008 Crafting Contest entry: the Mandy Bento! I have better pictures, but I like this one cause it shows it in the case. Here is one of me making it though, provided by Susperia, who is my other soul-sister. She stayed at the hotel with me, lent me her rice cooker, cutting board, and fruit knife. My cousin Jenn bought me a bag of rice and cooking shears and also took me to Whole Foods on Thursday. Thanks to you both for the help! I couldn’t have done it without you!! I had to go up on stage and I was so nervous and happy that I brain farted and instead of wittily telling people that everything in the bento was made out of Vana’diel ingredients, I blurted out, “I made it this morning.” This made people laugh and made others annoyed, since it sounded like I cheated and submitted mine the day of Fan Fest. What these people didn’t realize was that I’d spent weeks brainstorming how to make the mandragoras and that I had a little notebook with a little sketch. As I mentioned in a previous blog post, I had to go to 3 different markets to get the right sized ingredients and the enoki mushrooms. 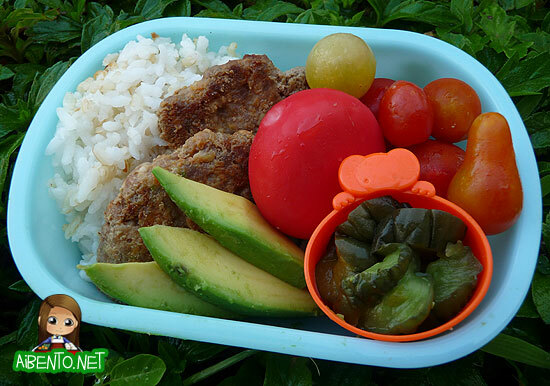 Speaking of those mushrooms, I grossly used the same batch for this bento. They were still ok in the fridge so I simmered them in soy sauce, bagged it, and shoved it into my suitcase. The bag then proceeded to pop and spill nasty soy sauce and mirin sauce all over my suitcase. I think the inari skins bag popped too and melded together with it in saucy glory. I finally figured out what the odd smell was when I got home. I forgot the icepack so ewww! But I figured, whatever, no one was going to eat it. I skinned a pomegranate for the Lycopodium flower before I left and took that with me too.